#1 PETE – Think bottles like water, juice and soda, or plastic jars like mayo, peanut butter, or spaghetti sauce – rinsed out and food residue removed. #2HDPE Natural – think CLEAR store brand jugs that contain milk, cider, orange juice and water – clear or “translucent” ONLY in this category – empty of all liquid. 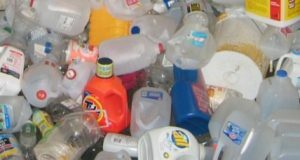 #2HDPE Colored – Assorted colored bottles such as detergent, plastic coffee containers, etc. – rinsed and emptied. NEVER ANYTHING MADE WITH BLACK PLASTIC OR ANY CONTAINERS THAT HELD MOTOR OIL/FLUIDS, PESTICIDES OR MEDICAL WASTE. Deposit them on the upper drive thru floor in the designated plastic bunkers. Containers must be rinsed or wiped clean of all food residue or they belong in the trash/garbage. The two main uses for recycled plastic are plastic lumber and new carpeting.